Sergei Lavrov’s calls to establish domestic negotiations in Ukraine should be taken at face value. The referendums on the political independence of Lugansk and Donetsk did not bring about any fundamental changes in the situation in Ukraine. It is obvious that the results of the polls will not be recognized in the world - or even in Russia, despite Moscow’s respectful attitude toward the popular votes. Judging by the public’s tone, the residents of Donetsk and Lugansk understand this as well. It would be wrong to perceive the results of the referendum and the declaration that followed as a clear decision to withdraw from Ukraine. Rather, the results are a clear demonstration of the fact that the country will face imminent disintegration if a broader dialogue is not established. However, the mentality of the current Kiev authorities, who were responsible for the overthrow of former president Viktor Yanukovych and consider their political opponents to be either losers or enemies who should be defeated at any cost, is preventing this dialogue from taking place. Their goal is clear: The authorities want to exclude the regions with predominantly Russian-speaking populations from the political process during the ongoing shift in power. In order to understand the logic of the Russian authorities, it helps to recall the recent meeting between President Vladimir Putin and his Swiss counterpart Didier Burkhalter. The aforementioned ‘roadmap’ and the intensification of the OSCE’s role in resolving the crisis were discussed at the meeting, but nobody proposed a plan for resolving the crisis in Ukraine. Although the Ukrainian question was addressed within the framework of a U.S.-Russia format even in Geneva, the political crisis in Ukraine is developing independently, and it is impossible to resolve it without engaging the key parties in a dialogue. The main points brought up in the meeting, which demonstrate Russia’s strategy in the conflict, were the request to postpone the referendum in eastern Ukraine and the question of guarantees provided for local residents after the presidential elections in Ukraine. The proposal effectively became a call for a dialogue with the new Ukrainian authorities, and the question served as the starting point for this dialogue – though the condition for the dialogue can be only the cease of military operations against the opposition and the disarmament of Kiev’s radicals, outlined in the Geneva memorandum, dated April 17. The statement concerning guarantees for the opposition and for the people of eastern Ukraine [that was made by the Russian side] at the meeting in Moscow is very important. It sets the tone for future negotiations, should such negotiations take place. The main idea was to create a format for the negotiations, appoint representatives from the east, determine what the main issues are, and leave all of this information for the future president, most likely to be [businessman and politician] Petro Poroshenko. This would provide hope that there would not be a refusal to compromise after the elections. But for now, the presidential candidate says that he does not see an alternative to the military operation. Russia is undoubtedly interested in seeing a presidential election in Ukraine. Moscow needs to have legitimate partners in Kiev. Otherwise, the Ukrainian authorities will confine all of their communications to the West, and the history of Ukraine will be written accordingly. The new Ukrainian authorities understand this, even though they continue to spread panic, trying to convince everybody inside and outside the country that Russia is ready to deploy troops and disrupt the elections. Russia has a vested interest in Ukraine’s stability. Russia’s current indirect participation in the Ukrainian crisis was an unavoidable reaction to the destabilization of a neighboring country that is very important to Moscow internationally, economically, historically, and humanistically. Prolonged instability could destroy a connection established through hundreds of years of shared history and lay the ground for more effective policies aimed at distancing Ukraine from Russia. 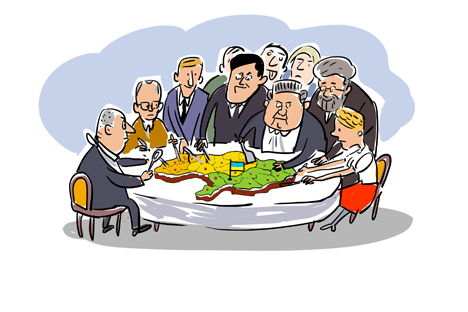 Russia’s other interest is also quite apparent – the federalization of Ukraine. It doesn’t make sense to conceal that this would allow Russia to maintain influence in Ukraine, regardless of any sudden government changes in the future. But federalism could also serve as a stabilizing force in Ukraine, since it will force any new government in Kiev to maintain a balance both in foreign and domestic policy. The Russian scenario for Ukraine is optimistic. In reality, the process of institutional degradation could continue and become irreversible. In this case, an attempt to isolate the Russian-speaking part of the population would result in the disintegration of the country and a geographical expansion of internal protests. If we consider what happened last winter to be a revolution, it becomes apparent that the process is incomplete. Unprecedented economic difficulties and the emergence of protests on a more significant level lie ahead. The consensus among the elite is fragile, and a number of politicians, including Yulia Timoshenko, are ready to continue the fight for power, even if this fight means another Maidan. The Ukrainian revolution, if one can call it that, has not yet led to a rotation of the elite, the emergence of new faces, the redistribution of property, and large-scale human losses. If a negation process is not initiated, all of this could happen very soon. Dmitry Ofitserov-Belsky is an associate professor at the Higher School of Economics.